G is for … ? Are you guys having fun guessing my portraits? I am having so much fun drawing them. Who knew?! Not I, said the fly. I’m tempted not to give any hints for this one. In fact, I won’t. Let’s see how you guys do on your own. If you guess, and don’t see your comment appear for several hours, it’s because you guessed correctly. I want everyone to have the fun of guessing, so I hold correct guesses in moderation. Anyway, I have to tell a story first, because it still makes me smile to think of it. My subject appeared on an episode of Sesame Street when my daughter was so little and never missed a show. She had a long talk with Elmo (who is probably my favorite of all of the muppets) as the guest star of that episode, and although I’d always admired her, something about that conversation between her and Elmo just ramped up the happy for me. It was very tenderly done, as though Elmo were real, and I just loved it. But I digress! I do most of my artwork fairly late at night. My brother, the artist gave me a great tip over the weekend, which I first put into practice with this drawing. Thanks to his suggestion, when I got the eyes outlined on the page, I felt as though I could already start to see my subject emerge. Once I got her mouth drawn in…I almost can’t describe the feeling I had as I continued. It was a joy to stare into her smiling face throughout. At one point, it almost felt as if she were my older sister, watching from my sketchpad with amusement as I finished the drawing. I realize that may sound strange, but over a couple of hours, you develop a relationship with the subject, and they can become pretty real if you start to see a likeness early. (Well, and it was getting pretty close to midnight too, and I’m pretty sure that played a role, lol.) The cool thing in this instance is that I really did see the likeness, and it just made me so happy that it was quite hard to sleep afterward! I can only hope to repeat the experience with my next try, so I’m planning to bring out a British actor for you tomorrow. He has a much more vanilla face, and so you guessers will have your work cut out for you with this one! By the way, I hope this post is an encouragement to everyone out there who *thinks* they can’t draw. I could not draw a simple outline of a bird in September! Believe it or not, it’s the truth. All my life, I thought only people like my sister and brother could draw, because they were born with “the gift”. Well, guess what? They have a lot more miles on their pencils and paintbrushes than the rest of us do, too. I’ve learned in this journey that drawing is like anything else in life: if you really care enough to consistently practice, you can do anything you set your mind to. And I do mean anything. I firmly believe this. Thanks for visiting, and I hope to see you again tomorrow. Got it .. but will keep it … too early for a spoiler. Good job I’ve recognized all but one – I didn’t even know that guy after it was revealed. 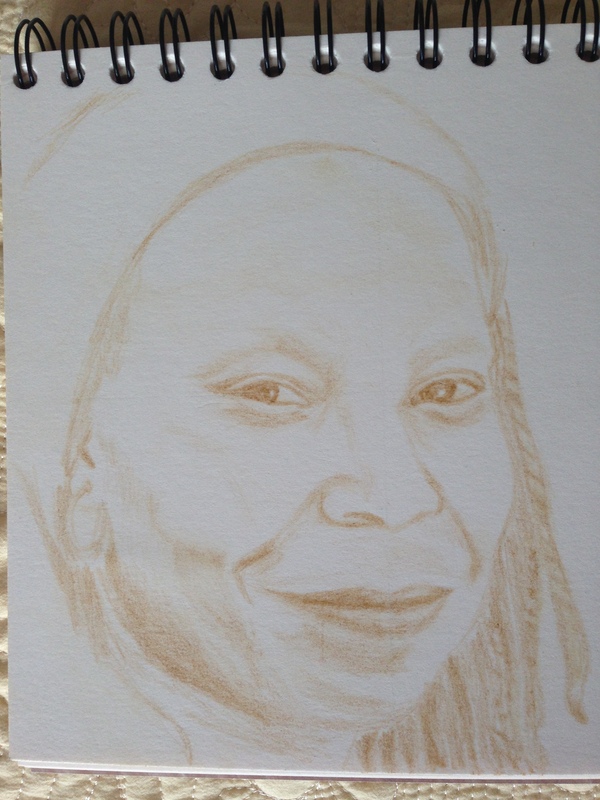 I am so encouraged by your post re the Whoopi drawing. (I hope I am writing this comment in reply to the right post–Wordpress does not make that very clear.) Your drawings are so fabulous that I, apparently like you re your sibs, thought that you have the gift and I can struggle along but will never . . . so I am ASTOUNDED that you just started this last fall. I’m going to get out my sketch book today. Yay, Wisemarian!!!! You just made my whole day! I can’t wait to watch your progress. The journey is a delight. Other than my family, I can’t think of one thing that thrills me more. Cheers, and may the Force be with you! That’s really good. You did a great job on the cheek bones and the shading is great. Thank you! She was a joy to draw. Her face is amazing. I need more faces like this. wow, amazing job! I got it right away…Whoopie! Thank you again for visiting me, early in the morning, and improving the day. I share your sentiments about bonding with your subject – I did that last week, drawing David Crosby. Incidentally, your portrait looks like Whoopi. Thank you, David, and you really made my day with your post this morning too. You put into words what I’ve been feeling. Thank you. Thank you!! This is the first one I’m really proud of. Thank you so much! I can’t wait til you try. You’ll be amazed what consistent practice will do. I’m living proof you do not need “the gift”, whatever the heck that is. Btw: what was the tip? He said to draw a line in the center, and cross it with the eyes on the horizontal…and then do the same on your sketchbook. Then take measurements to place the features, adjusting for proportional changes between the drawing and photo sizes and go from there. The angle of her head was so different from what I’m used to drawing that I tried it, and it worked! I’m hoping that after a little more practice, I won’t need to do this, because it’s very left-brain and strange for me, still, but it’s teaching me a lot about where I think a line should be and how far it should go vs what is actually in that quadrant of the reference photo. I’m learning a lot from this method! Gotta use the left brain to engage the right brain! Love it- thank you. Oh this is a really good one of Whoopi Goldberg! Very easily recognisable. Thank you so much for that sweet comment. You don’t need to give any hints. Your sketches are great. Daily sketches! That’s dedication. Kudos on that. Thanks so much, Jo! I’m amazed at what you create daily, too! You rock! Great image of Whoopi Goldberg. thanks for the tip about the eyes. That is useful. You’re welcome, and thank you for your kind remark. I can’t wait to see WP blooming with portraits. Ann has already started! Who knows who else may join in – hopefully you! Wow, your portraits are so true to life, I saw this face and immediately recognized it is W. G.
Thank you so much! I really appreciate your comment. Aaaah, directly recognized her: Whoopie!!! I love her!!! She always seems to be such a nice person! Oh, and great drawing of course!!! Thanks, Ann, I love her too! I’m glad you like the drawing. This is the first one I’ve been really proud to show. I’m not into the celebrity culture so I don’t generally recognise these people, but I did do a pastel of her some years ago, ( from a photo, because there was good lighting on it) so yours was instantly recognisable. Thanks! I’m not into the celebrity culture either, but I was (sorta) about 10 years ago, so most of my subjects are much older. This is a beautiful portrait of Whoopi. I can’t believe I missed my chance to guess! Yesterday I was all caught up in another project and didn’t check my reader at all. I may have to try that left-brained tip someday. For now I think I prefer the right-brained guessing game though, even if it frustrates me sometimes. Thanks! I understand totally. I didn’t even want to go through the hassle until I saw no other way to get it done. Wonderful drawing! I think this may be my favorite portrait of yours so far! Thank you! It’s one of the few I really like of everything I’ve done, ever. I’m glad you like it!! Wow, girl, you have come SUCH A long way.. your portraits are really great. I don’t think Carson quite looks on his death bed, but looks a bit peaky. It is clear in either one who you drew! I am still impressed that you are still daily sketching or painting. great! Thanks! I really appreciate it! I can’t not do it, Rachel. I think with the stress of busy season, I just need it even more. So I sleep less, and have more energy than last year (with no art and more sleep). Makes no sense, but I’m going with it. I don’t seem to have much choice! Awesome job on drawing Whoopi! Thanks! She’s still my favorite.